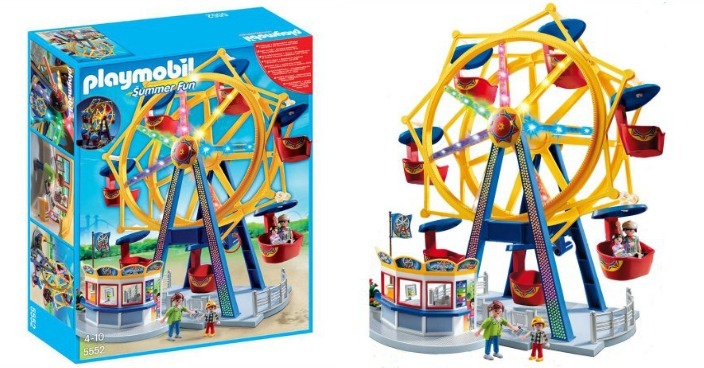 Playmobil Ferris Wheel With Lights Just $36! Down From $60! You are here: Home / Great Deals / Playmobil Ferris Wheel With Lights Just $36! Down From $60! Right now you can get this Playmobil Ferris Wheel With Lights for just $36 (Reg. $60) at Walmart! Climb to new heights with an exciting ride on the Ferris Wheel with Lights. Equipped with colorful flashing lights (batteries not included) and seven red and blue gondolas, this ride can accommodate up to 14 people. First, check to make sure you meet the ride’s height requirement before purchasing a ticket and hopping into the next available gondola. Once everyone is safely seated in their gondola, turn the crank on the side of the Ferris wheel to start the ride.